During his 28 years as a holistic practitioner and health expert on syndicated TV and radio, Dr. David Friedman has interviewed hundreds of world-renowned doctors and best-selling authors. From proponents of a vegan, paleo, mediterranean diet to a gluten-free and low-carb diet, the opinions are as different as night and day. 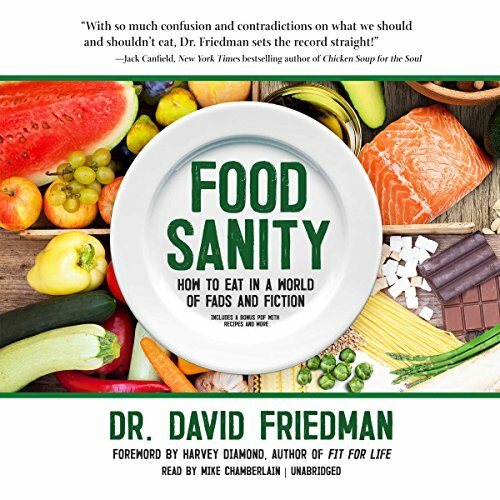 After becoming frustrated with all the conflicting research and opinions, Dr. Friedman wrote Food Sanity, which explores all the fads, facts, and fiction. Using a common science meets commonsense approach, this groundbreaking book finally answers the big question: What the heck are we supposed to eat? Listeners will discover never-before-heard nutritional and dieting advice that will ensure they get the maximum benefits from their food and dietary supplements. Food Sanity offers a definitive blueprint on how to eat in the unhealthiest developed country in the world ... the good ole' USA. This book is a must read! It is full of great information and being very health-conscious and educated on nutrition myself, I learned things I never knew! I highly recommend reading this book! Informative book, but consume with a grain of salt. While Dr Friedman knows his subject very well, I am very skeptical of anyone who tries to, even indirectly as is the case in this book, to promote holistic supplements. This isn’t the point of the book, but one of the examples that I’d take with a huge chuck of salt. However, I would still recommend the book to friends. Chock full of valuable information! A must read for everyone. He explains the behind the scenes of the food and drug industry. He gives you tangible steps you can take to improve your health today. This book has changed what I eat!, how much I eat and how I will look after my body for life. Thanks to the Author for such a complete work.